Paris may well be the most photogenic city in the world. The only time I ever thought it looked ugly was in Woody Allen’s idiotic fantasy, “Midnight in Paris.” I don’t know how he did it — maybe with yellow filters — but in that picture, Paris looked like it had jaundice. Paris is also a great setting for cartoons. Here are examples from three cartoons that make effective use of the City of Lights. The first one features rats; the second two feature cats. In all three, Paris is as much a character as are the cats and rats who inhabit it. Thank you, guys. When I was . . . I was nine and I asked my dad, “Can I have your movie camera? That old, wind-up 8mm camera that was in your drawer?” And he goes, “Sure, take it.” And I took it and I started making movies with it and I started being as creative as I could, and never once in my life did my parents ever say, “What you’re doing is a waste of time.” Never. And I grew up, I had teachers, I had colleagues, I had people that I worked with all through my life who always told me what you’re doing is not a waste of time. So that was normal to me that it was okay to do that. I know there are kids out there that don’t have that support system, so if you’re out there and you’re listening, listen to me: If you want to be creative, get out there and do it; it’s not a waste of time. Do it. Okay? Thank you. Thank you. And this is Peter O’Toole as the formidable food critic, Anton Ego. O’Toole brings to bear everything he has learnt about acting over the past fifty odd years. It comes at the end of a gorgeous, but extremely tiresome, obstacle-course cartoon: you know it’ll all work out, but they keep piling on the difficulties till (if you’re anything like me) you can’t stand it. In the movie theatre, the excessive plotting drove me very nearly mad. The animation is spectacular, but I was on the verge of leaving throughout nearly the entire second half of the picture. A friend had insisted, however, that the ending was the best part and made me promise to stay till the end: “There’s a Proust moment in it that you’ll love.” “What do you mean by ‘Proust moment’?” “I won’t tell you: you’ll know when you see it.” He was absolutely right — and it was a thrill. In the last reel, several amazing moments happen, one after another, and they culminate in this beautiful oration. In the years since “Ratatouille” was released, Peter O’Toole has been in a half dozen more pictures, but I can’t imagine a better swan song for an artist of his intelligence, sophistication and wit. O’Toole has spent much of his career elevating second- and third-rate material; it’s marvellous to hear him handle first class stuff, as he does here. Do yourself a favor: spring for the DVD and a good sound system and hear it properly. It makes a difference — a big one. A dreadful, dreadful cartoon, but Harold Arlen wrote one or two good tunes for his old friend Judy Garland to sing in it. E.Y. (“Yip”) Harburg did the lyrics. The score, as a whole, is a negligible affair, but I rather like this one song: “Paris is a Lonely Town.” Nice palette in this sequence, too. But nearly everything else in the picture is revolting, especially every second in which the vile, unfunny Red Buttons is involved. ‘A Cat in Paris’: Original French poster. Wow! 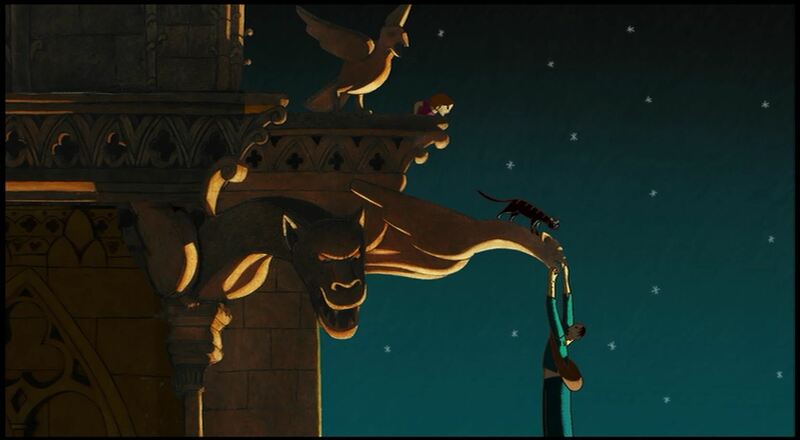 Take a look at this clip from “A Cat in Paris” (Folimage, 2010). I prefer unapologetically two-dimensional hand-drawn animation to its computer-animated three-dimensional younger brother. Hand-drawn animation is lighter on its feet and more playful; it’s further removed from reality than computer-animated cartoons, yet it seems more human. I find it has more personality than computer-animation. Computer animators do wonderful things with blades of grass and individual hairs, with tidal waves and all sorts of complex crowd scenes that seem beyond the 2-D animators’ ability to convey. But I have yet to see a computer-animated human that I found pleasant to look at. Computer-animation does fur a lot better than it does skin. Humans in computer-animated features always give me the willies. The shot at sunrise reminds me of de Chirico, but without the dread and terror. Here’s a clip of the heroic cat burglar, Nico, and his kittycat assistant, Dino, as they make their nightly rounds. This is very hard not to like. That’s Billie Holiday who sings the beautiful Ralph Rainger tune, “I Wished on the Moon.” Dorothy Parker wrote the lyrics. I’d like the cartoon a whole lot more if they used more of this style of music and less of Serge Besset’s Philip Glass Meets Benny Herrmann score. 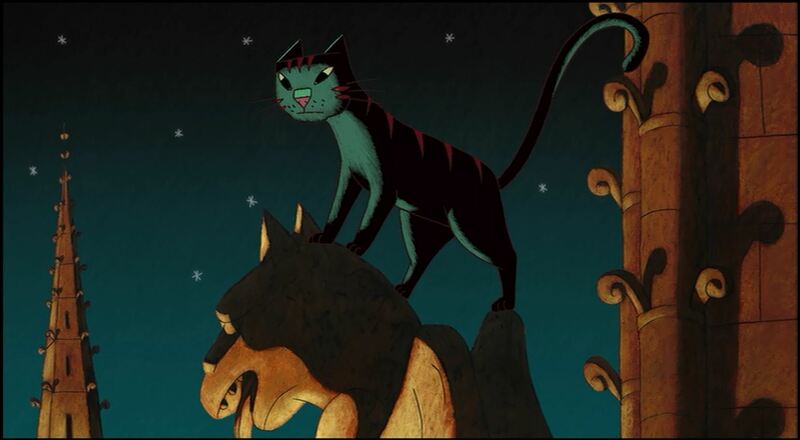 “A Cat in Paris” is a lovely, modest cartoon. The whole is not, perhaps, quite as great as the sum of its parts, but it has more than enough wonderful parts to make it well worth seeing and owning. It’s entirely likeable and diverting. Next to the arresting angles and wonderful palette used throughout the cartoon, what I like most is the near absence of the sort of non-stop, frenetic action sequences that are the hallmark of all Pixar cartoons. It’s also shorter than the average Pixar feature. “A Cat in Paris” is only 62 minutes long; in my view, that is long enough for any cartoon. The hurlyburly of Pixar features wears me out; they rarely give you a moment to relax and catch your breath: they’re too busy astonishing you while they put their adorable, anthropomorphic critters through the torments of hell. 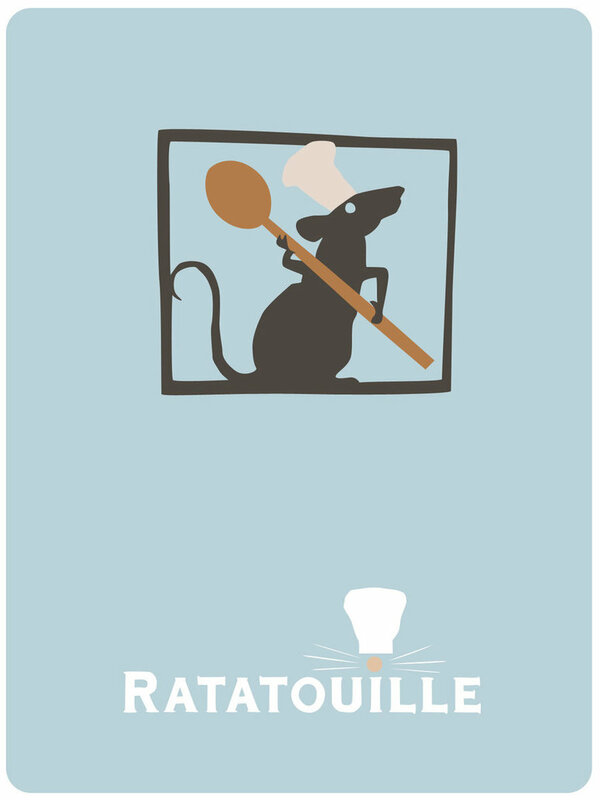 On the other hand, “Ratatouille” has some of the most amazing images of Paris I’ve ever seen and it has that thrilling score, so I’ve learnt to put up with its whirligig plot. Dino the Cat at Notre Dame. 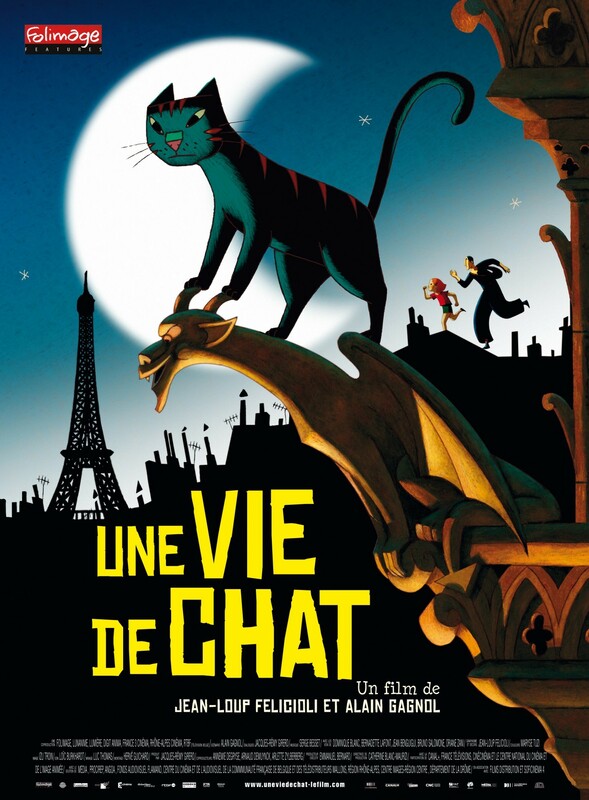 The DVD and Blu-ray of “A Cat in Paris” offer both the original French and the English version. I think it sounds more charming in French, but the English version is also quite nice. Anjelica Huston is very witty as a baddie. This entry was posted in Main and tagged Anjelica Huston, Anton Ego, Atonement, Billie Holliday, Can in Paris, Dario Marionelli, Dorothy Parker, Gay Puree, Harold Arlen, Judy Garland, Michael Giacchino, Midnight in Paris, Paris, Peter O'Toole, Proust, Ralph Rainger, Ratatouille, Woody Allen, Yip Harburg on July 25, 2013 by TR.